During the weekend of The Great Escape Festival virtually the whole of the UK music business moves to Brighton for a few days; the streets are full of musicians hauling gear round on various wheeled appliances and every pub and club has a live music line-up. 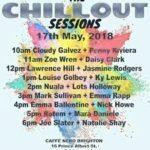 With all of those musicians around, why not put together a daytime event with musicians in Brighton for TGE and a few others shipped in for the occasion. Well, that’s exactly what happened in Caffe Nero (huge supporters of unsigned talent) with the help of Talentbanq (also huge supporters of unsigned talent). The concept’s really simple; two days of live music with two artists appearing every hour between 10:00am and 7:00pm for two days. That’s 36 artists over two days. I only did the Thursday but saw a mind-blowing array of talent. The fun kicked off at an unearthly hour; singers generally don’t like morning gigs but Cloudy Galvez and Penny Riviera totally owned the first hour of the day. Cloudy’s improvisational style followed by Penny’s raw, smoky torch songs started the day off perfectly and set the tone for what was to come. 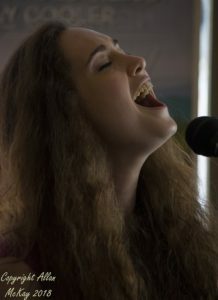 As the day unfolded there were superb performances across a wide range of musical styles from the delicate whimsy of Jasmine Rogers to the looping wizardry and powerhouse vocals of Lawrence Hill and Mark Sullivan. 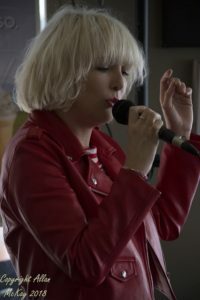 Zoe Wren combined folk and jazz, Louise Golbey and Ky Lewis added a bit of soul while Nuala and Lots Holloway powered through their respective sets in the usual barnstorming style. 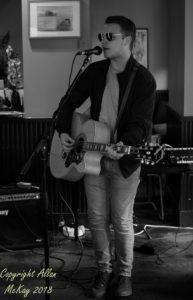 Bringing events to a perfect close, Joe Slater gave his usual passionate performance of his own beautiful and spiritual songs and a cover of George Harrison’s “My Sweet Lord” before Natalie Shay ended the day with her own powerhouse performance. My only regret was that I had to miss day two; the idea of loads of hungover music biz types being assailed by caffeine and the phenomenon that is Hollie Rogers. I think that might actually wake the dead. Anyway, I think we’ll be doing it all over again at the Caffe Nero stage at Cornbury Festival in July.